ADF&G extended the hunt around Togiak to manage the area's robust population and provide more hunting opportunity. As of Friday, 17 moose have been harvested under the two permit hunts in 17A. The Alaska Department of Fish and Game has extended the winter moose hunt for game management unit 17A around Togiak for another month. It is now scheduled to close at midnight on Feb. 25. So far 17 moose have been harvested – 11 cows and 6 bulls. That falls short of this year’s quota of 30 cows and 25 bulls. This is the second year in a row that the winter hunt around Togiak has been extended. Area wildlife management biologist Neil Barten said that the extension is an attempt to meet the unit’s fairly liberal harvest objective and provide more hunting opportunity during a warm, wet winter. 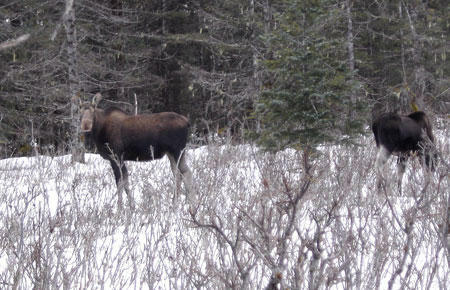 In doing so, Barten said, they hope to curtail the size of 17A’s robust moose population. “We believe we have more moose on the landscape than we really want. So we’re actually trying to take a few more moose every year and bring that density down a little bit,” he explained. The target population for 17A is 800 to 1,200 moose. The most recent survey, conducted in 2017 by the U.S. Fish and Wildlife Service, showed a population of about 2,300 animals. But area biologists are now considering whether the unit's population objective may be unnecessarily conservative. According to Barten, the original population model did not include certain habitat types that provide food for moose in the area, and additional studies might result in an increased target population. In the near future, however, he does not expect the harvest strategy to change. The good health of the moose in 17A isn’t unique; Barten points out that 17C has a robust population as well. One reason that 17A has such a liberal harvest strategy is its high rate of calf survival. “In 17C we have, just like 17A, very solid moose. Much huger and much more robust animals than you see in many parts of the state. Twining rates that are about as good as you’re going to get. And pregnancy rates of animals that at two years old are having calves, that’s pretty darn good, both in 17A and 17C. The one difference between 17A and 17C that really seems to be magnified is the lack of calf survival in 17C. 17A is doing much better in that department,” Barten said. Possible reasons for lower calf survival in 17C include higher predation by bears and wolves. 17A has two permit hunts, one for cows and one for bulls. This means that hunters can take two animals; the bag limit is one cow and one antlered bull, although hunters who already bagged a moose in the fall are only allowed to harvest one additional animal. ADF&G is still waiting for a number of hunters to submit outstanding permits for the winter moose hunt in 17B and C. Permit holders must turn in their harvest reports whether they hunted or not. Failure to do so could result in a ban on hunting under a permit for the next year. Hunters can still submit reports online, by mail, or in person at the ADF&G office on Kenny Wren Road in Dillingham. Contact the author at isabelle@kdlg.org or 907-842-2200.